Purple flowers are one of the top wedding decorations. Happily, there are gorgeous purple flowers available in every season. Here are some great purple wedding centerpiece ideas for any time of the year. In spring, there will be an abundance of lovely purple flowers from which to choose, ranging from lilac to deep plum, and everything in between. Bulbs are among the most popular spring blossoms, and many of them do come in a shade of purple. Tulips are iconic of spring and rebirth, and a very simple idea for a centerpiece is to arrange a simple bouquet of elegant purple tulips in a clear glass vase. It is not particularly fancy, but the flowers themselves are so perfect that they need little adornment. A beautiful idea for a purple centerpiece for an afternoon wedding in the spring would be to plant a collection of hyacinth flowers in a white ceramic pot. For a more casual effect, purple hyacinth planted in a wooden box whitewashed in white or pale green would be lovely. They would also make a great parting gift for guests to take home at the end of the reception. A more lush spring centerpiece design idea is to take an abundance of lavender colored sweet peas and combine them with lilac roses, white peonies and some trailing greens. Arrange loosely in a tall footed urn for a breathtaking centerpiece. Summer also offers some great options for purple wedding centerpieces. Many brides enjoy planning weddings which feature a range of purples throughout. For instance, the bridesmaids might wear lavender chiffon dresses with plum bridesmaid jewelry sets (or vise versa; rich plum bridesmaid dresses with pastel sets of jewelry). 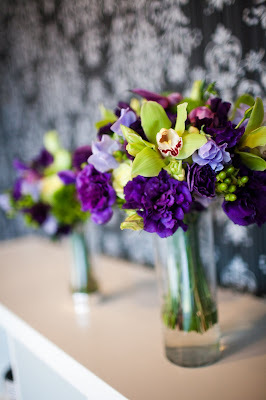 A mixture of purples in one centerpiece is another great way to create depth and interest with your signature color. Try combining dark purple mini irises with medium purple freesia, roses, and fragrant lavender for a beautiful centerpiece. Or create a classic table arrangement with pinky-purple hydrangeas, lavender roses, and lilac parrot tulips. When people think of fall weddings, the colors that come to mind are often reds, yellows, and oranges, but there are actually some wonderful purple flowers in season in the autumn. The informal look of purple asters mixed with white mums and lilac colored statice would be great for a country wedding. For even more impact, arrange the flowers in a hollowed out eggplant. For more formal weddings, create the centerpieces from bridal flowers which are available year round, such as purple roses and lisianthus. In the winter months, weddings tend to be very elegant. A gorgeous idea for a winter wedding centerpiece would be an arrangement of deep purple orchids. Try a spray of plum dendrobium orchids arranged in a dramatic tall dark purple vase with interesting greenery for a modern and sophisticated centerpiece. Or create a rounder table arrangement by combining the orchids with burgundy carnations and deep red roses; it would be stunning for an evening reception. Orchids can also be staked and formed into breathtaking Zen inspired table decorations; try vivid purple Mokara orchids paired with bright green accent flowers.